Hey Alice, first of all, please tell us a little about your practice and the ethos of your work? I first started making Psychedelic installations for festivals about 2 years ago for an underwater themed festival The Subsonic Weekender. I made a huge coral reef sculpture using recycled plastics, a lot of which were found on beach cleans. This installation really kick started my obsession with UV and got me really excited about making work from litter, in particular litter from beach cleans. There is something truly satisfying about turning something ugly and dangerous into something beautiful with an important message. I am extremely passionate about conservation, ocean conservation in particular. All my work is focused on highlighting the issue of ocean plastics. I am fascinated by coral and it’s crazy colours and patterns, especially it’s UV and bioluminescent displays. All of my work is inspired by coral reefs and alien like creatures you can find living there. I think it’s the most Psychedelic display found in nature. 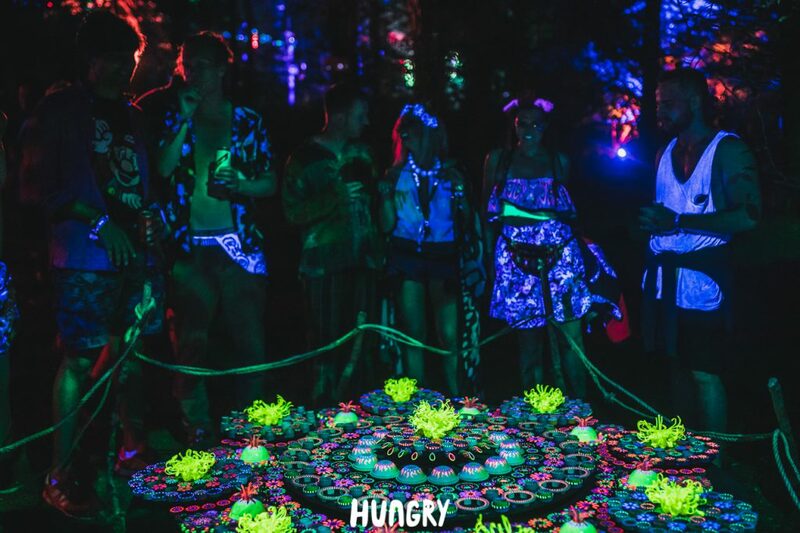 They are the perfect subject for artwork that has to transform from day to night, with beautiful vibrant colours in the day, and mind blowing psychedelic UV displays at night. Ideal for Psychedelic festivals! 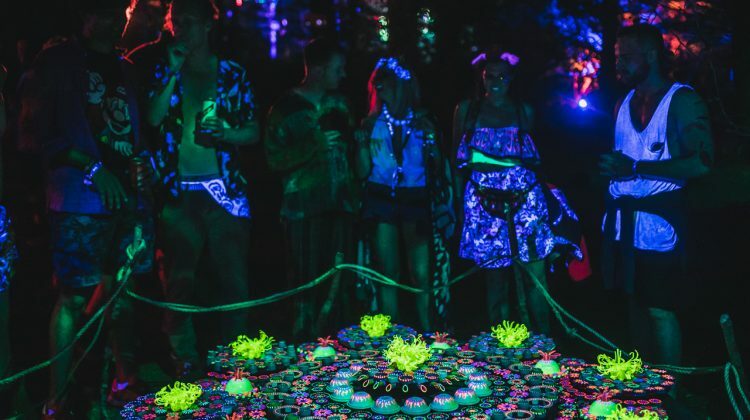 Please can you give us a description of your piece featured at Noisily this year, including materials, technology and concepts? My piece is a 6ft mandala inspired by coral reefs and their amazing psychedelic UV and bioluminescent displays. It is made from recycled plastics including over a thousand plastic bottle tops, plastic bottles, hose pipes, coffee cup lids, polystyrene and an array of random plastic items. Each piece is hand painted with UV dots and patterns. They are all mounted on wooden circles, the inner circles slowly rotate using mirror ball motors, the outer circles can be gently spun by viewers for an interactive element. After watching the circles for a while, on looking away the vision of the viewer will continue to warp and move similar to the effect of looking at an optical illusion video. The lighting and movement in combination makes for a very trippy experience. We were pleasantly surprised with just how much the work fitted with the brief of Use Your Illusion in the end! I wanted to make a mandala as Mandalas are loaded with so many meanings depending on culture. Many cultures believe that the Mandala represents the human soul, the miniature universe of the practitioner. My mandala shows how I see the soul of our consumer culture, represented in plastic as a symbol of how estranged we have become from our natural world. To me plastic represents everything wrong with our current culture and our treatment of our beautiful Earth. It represents our disconnect, our apathy and our hubris. Mandalas also depict deities. The plastic mandala depicts the new and universal 21st century religion that we all subscribe to, that of consumerism. However the piece also represents hope. It shows that no matter how astray we have become, there is still beauty in all of us, and hope for a better world. Music and art are our gift to the world. They are our integral part in the ecosystem, something unique to our species and, in my opinion, the essence of what it means to be human: to create. Through making something beautiful from waste, I want to show my hope for humanity. Mandalas are a way of creating order out of chaos, and serve as a meditative and therapeutic tool. This mandala helps me to find order in the plastic chaos we have created. It represents the ingenuity and creativity of the human spirit, and I believe this is what is going to save us and our amazing planet. What first drew you to Noisily Festival and made you want to be involved in it? I heard about Noisily from a friend who said it was by far his favourite festival with the best music and the best vibes, I love small festivals with a focus on decor and art and saw the amazing installations and decor from previous years which inspired me to get involved. Most of all I was inspired by Noisily’s focus on sustainability and environmental awareness. I love festivals but I am often saddened by the impact tat festivals often have on their surrounding environment and the residual effects of poor waste management. It was really refreshing to read about Noisily’s commitment to environmental protection and education. The many talks and workshops around many issues I am passionate about was another thing that told me this festival was for me. What have you learnt from your experience at Noisily and how has this changed or evolved your practice? Most of all I have learnt to be more confident about my abilities as an artist. The response from the wonderful people at the festival has really fuelled me to continue making this kind of work, especially for festivals. I am so excited to develop more work like this and see how far I can take it. I really feel that I have found my niche and it is amazing to have so many people love, appreciate and most of all understand my work. I have learnt that no matter how ambitious a project might seem, as long as you have a goal and the passion to follow through there’s no challenge too big. It may seem cliche but as long as you have faith in yourself you can achieve your goals, and probably surprise yourself with what is possible. Another really important thing I learnt was to ask for help. I was so lucky to have Marcus help me with the electrics, lightning and transportation. I couldn’t have done it without him. If you have a big intimidating project in mind, don’t be afraid to utilise the talents of those around you. Collaborating opens up so many more possibilities and is usually more fun and rewarding anyway! Did you face any difficulties with your piece and how did you overcome these? The figuring out of the electronics was quite tricky but I was lucky enough to have the help of my friend Marcus who is an electronics genius. We had trouble getting the circles to spin in opposite directions without the wiring catching and causing potential problems. In the end we managed to find a battery powered motor for the top circle which worked well. Another issue I had was during set up when the sun melted a lot of the glue and the whole thing started to fall apart! After a minor panic I managed to repair everything in good time thankfully! What words of advice do you have for someone wanting to apply for an arts grant? Just go for it and don’t be afraid to aim high and challenge yourself. I thought it was a long shot to be chosen along side so many talented artists but I was pleasantly surprised. Really think about the brief and your audience, and get excited about what you can offer them. If you feel like you’ve bitten off more than you can chew that’s probably because it’s a really awesome idea! If you’re willing to put the time in, I promise you it’ll be one of the most rewarding things you’ll ever do so don’t be afraid to work hard! The crowd at noisily will reward you! The grant really helps to open up more possibilities for you so don’t be afraid to push the boundaries of what is possible. You’ll probably end up surpassing your own expectations and gaining a huge amount of confidence and pride from the whole experience! How has the promotion of your work through Noisily’s fan base and online channels helped you as an emerging artist? Wow what can I say?! The response I’ve had from people has been amazing! So many kind words and enquiries about my work. I’ve managed to make several really useful contacts and connections with others sharing my passions and values. I’ve had offers to collaborate with other artists and get involved in projects focused around ocean conservation, in particular the issue of ocean plastics. It’s amazing to know people really get the message of my work. Most of all it has given me so much more confidence in myself as an artist. Being featured in Noisily’s top 5 artists really blew me away! I can’t really put into words how much the whole experience has impacted me. Just watching people enjoy the work was so fulfilling, and speaking to people about it even more so. It was probably one of the most rewarding experiences of my artistic career! It’s mainly down to the beautiful people who come to Noisily. Thank you Noisily! What is in the pipeline for you? Any exciting opportunities or works in progress you want to tell us more about? I am currently traveling in Asia where I am experiencing some of the worst plastic pollution first hand. I am on my way to the Philippines in the new year to a project focused on turning ocean plastics into artwork. I’ll be diving, doing coral reef surveys and cleaning litter from the reef and then making it into eco bricks or artwork, it’s my dream project combining all my passions into one! Very excited! Finally, please tell us your favourite thing about Noisily? I don’t think I can can chose one thing. Noisily is hands down the best festival I have ever been to and one of the best experiences of my life! The location is perfect, the size is perfect, the people! Oh my god the people! Best people you’ll ever meet! The music! I was totally entranced by the liquid stage all weekend! It’s totally my happy place in my mind. The decor and lighting were just perfect! So well thought out! The visuals at the liquid stage were totally mind blowing! The workshops and talks were totally inspiring… I also LOVED how clean it was. I walked around barefoot all weekend no problem, it was so lovely not to be surrounded by litter at a festival! Most of all it was the people and the atmosphere. Such an amazing sense of family and community, I truly felt a deep sense of love, belonging and connection with everyone there, it was incredibly moving actually. I can honestly say noisily changed my life, thank you Noisily!